Interesting building. How many stories ? "No more rooms available. We're all booked up." Oh you did it then. I thought I told you to shelve that idea. "Darling, you know the library fines are building up, don't you?" 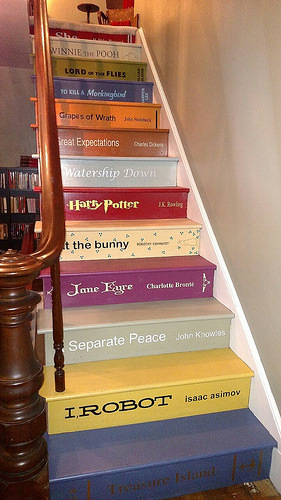 Do you have a set of stairs I could read over a weekend? Don't use the elevator. They're all done as talking books. Careful on the stairs, they're covered in spines. The wheelchair ramp is A Brief History of Time. I want to move house, but I can't because I don't have the title deeds. "Hello Acme Carpenters? There's been a bit of a mix up. I asked you's to fix my staircase and build me a new bookcase.."
Steps. Always good for a Tragedy. "Do you have 'Upstairs Downstairs'? "This escalator is useless. I've been on Treasure Island for weeks." "We're very pleased with the result. It's been a text book conversion." Do they have a Nobel prize for carpentry ? Not pictured: 'Decline and Fall' by Evelyn Waugh and Don DeLillo's 'Falling Man'. "Do you think I've got woodworm ?" "No, but you do have bookworm." It's the only way he ever goes up for a bath. We like to call them Waterstones. The orange one is the naughty step. Every night after a few drinks, my wife theatrically falls down the stairs. "This makes you feel at tome." It took pages to build. The trouble comes when I take one up to read in bed.